Allegra Boverman/Gloucester Daily Times. Cristian Maya, a member of Eastern Action Sports Team (Team E.A.S.T.) 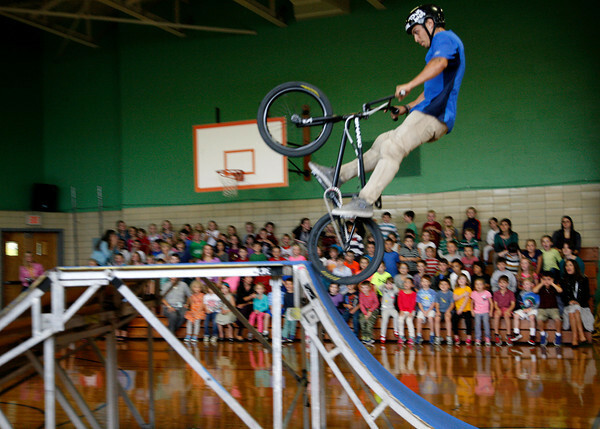 of Massachusetts, along with Danny Todd, took over the gym for two performances on Monday at Manchester Memorial Elementary School during which their BMX riders performed tricks and jumps and had a discussion with students about bicycle safety and maintenance, bullying, personal responsibility teamwork and character building. The event was ponsored by the school's PTO Enrichement Committee.